John Blackwell has been involved with the club for many years, helping with the coaching in the seventies, as Club Secretary from 1978 onwards and as General Manager since 1998. He has even been on the substitute's bench three time for the Pilgrims. He was a member of the Vauxhall Conference Management Committee for nine years and the Unibond League Management Commitee for five years. His biggest disappointment is that he was not good enough to play football at a top level. The match he most remembers is the FA Trophy semi-final against Altrincham at York Street back in 1985. He thinks that the standard of football played in the Dr. Martens League is very good, being the closest of the three feeder leagues to that played in the Conference. In his leisure time he enjoys watching sport on TV, reading the Saturday evening football papers and being with his family. Previous clubs: Bolton Wanderers, Clyde, St. Johnstone and Ayr United as a player and Stamford A.F.C as manager. Hailing from Scotland, he began his playing career with Bolton Wanderers, but he soon moved back north of the border to play for Clyde, St. Johnstone and then Ayr United. 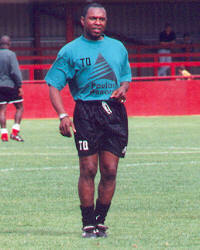 He was forced to give up playing football at the age of twenty eight, by a cruciate knee-ligament injury. His dramatic impact on United's fortunes in transforming them from relegation candidates to title challengers and ultimately the runners-up spot last season has made him a cult hero with the fans on the terraces. The players that Steve most admires are Kenny Dalglish and Roy Keane. His favourite grounds are Celtic Park and Sheepy Road, Atherstone. His least favourite grounds are Ibrox and the South Kesteven Sports Stadium, Grantham. The advice that he would give to a youngster who wants to make a career in football is to work hard and always listen. He plays golf in his spare time. Steve thinks that the standard of football in the Dr. Martens League is high and that any of the top four teams could play in the Conference. Previous clubs: Peterborough United, Gillingham, Northampton Town and Hong Kong Rangers. 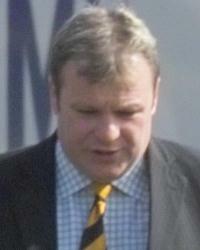 A defender brought to the club by Steve Evans to become assistant manager following Chris Cook's retirement last season. Formerly with Peterborough United, Gillingham and Northampton Town, playing over 350 League games and scoring 22 goals. He also gained four England Youth International caps. Had a spell in Hong Kong before returning to England in 1996 to join up with Steve Evans at Stamford, where he played in the club's championship winning sides. The biggest influences on his career have been the managers and coaches he has worked with. These include Peter Morris, John Gorman, Keith Peacock and Terry Venables. His favourite grounds are Peterborough's London Road Ground, White Hart Lane and Villa Park. The players he most admires are Pele, Bryan Robson, Glenn Hoddle and Mick Gynn. His most memorable games are his Football League debut for Peterborough United, his England Youth debut, and a win against Sunderland when playing for Gillingham in the Third Division Promotion Playoff semi-final in 1987. One of his biggest disappointments was losing to Swindon in the 1987 Promotion Playoff Final, in a replay after the first two games had finished level on aggregate. Other disappointments include breaking his legs three times and other assorted injuries. He hopes to become a full-time manager / coach one day. He likes watching basketball, cricket, rugby and kung fu, and in his spare time also plays cricket. John claims his greatest achievement was playing six games without getting booked. His biggest disappointment was getting booked in the 7th game! In his leisure time he likes playing cricket, golf and basketball and having a few beers with friends. Former England international goalkeeper Chris Woods was a pupil of his. His only superstition is that he wears an old club tracksuit at all matches. 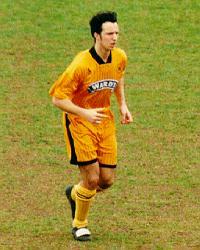 Previously with Grimsby Town, Peter returned to being a football physio with Boston United in 1997, after a period away from the game. He treats the players for any injuries they may have, and advises on home exercise and medication. Treatments include electrical therapy, ultrasound, use of the interfrential machine and muscle rubs. He keeps himself fit, as on match days he likes to be able to get to an injured player as fast as he can. He also runs his own chartered physiotherapy practice from his home in Louth. Paul is one of the most highly regarded goalkeepers in non-league football and is now in his eighth season with the club after joining United from Kettering Town in 92-3. Outstanding 18 year old reserve keeper who came through the Pilgrims' "Football For Life" scheme. 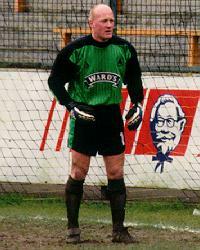 Achieved celebrity status after saving three penalties in the Lincolnshire Services League Cup Final in the 1997/8 season. Lee's greatest achievement to date has been his selection for England Schoolboy Trials. His most memorable match was playing for the Grimsby Town Youth Team against Arsenal. His biggest disappointment has been not being able to prove himself at professional level due to prolonged knee injuries. The players he most admires are Peter Schmeichel and David Seaman. In his spare time he likes playing tennis and basketball and having a laugh with his mates. He has two superstitions. He always puts his right glove on before his left glove and he has also started wearing a very dodgy psychdelic shirt underneath his goalkeeping jersey. He has trained with former England international keeper Chris Woods, and cleaned his boots! He has passed 7 GCSEs and also gained his FA Preliminary Coaching Badge. Previous clubs: Spalding United, Whittlesey United, Bury Town and Stamford A.F.C. Signed in January 2000 from Stamford AFC. The player he most admires is Ryan Giggs. Away from football he likes playing snooker and pool and watching boxing. One of the local younger, players who has managed to secure a regular first team place, is Joby Gowshall who joined us from Lincoln City. Joby said that he left Lincoln because he didn't enjoy his time there, and he wasn't guaranteed a place in the first team. He is enjoying his time with United because he has become regular in the starting eleven. Previous clubs: Leeds United, Rotherham United, Shamrock Rovers, Stalybridge Celtic, Gainsborough Trinity. Signed pre-season on a free transfer from King's Lynn. Previously with Arsenal, Chesterfield, Barnsley, Bradford City, Notts County and Mansfield Town. Has made 73 League appearances, scoring 1 goal (for Bradford City). Born in Derby. Previous clubs: Huddersfield Town, Norwich City, Northampton Town, Halifax Town, Burnley, York City, Scunthorpe United, Cambridge United and Aylesbury United. Signed from Ryman League side Aylesbury United at the end of last season. Previously with Huddersfield Town, Norwich City, who signed him up for £30,000 in July 1987, Northampton Town, Halifax Town, Burnley, York City, Scunthorpe United and Cambridge United. Made a total of 369 League appearances, scoring 20 goals. The player he most admires is Stuart Pearce. His biggest disappointment was not playing in the play-off final at Wembley for Burnley in 1994. He likes playing golf in his spare time and would enjoy a trip to the US to watch the Ryder Cup. When he has finished playing football he plans to become a driving instructor. He has a couple of superstitions. He always puts his right boot, sock and shin pad on before his left, and likes to be the last player to come out on to the pitch. Local lad Steve joined his home town club in the 1994-95 season after previously playing in the Conference for Kettering Town and captaining UCL side Bourne Town. Voted "Player of the Year" in his first season and again in 97/8. He is clearly a big favourite with the fans who appreciate his non-stop efforts. 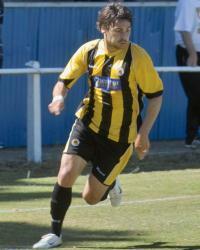 Has also played for an FA XI against the Combined Services. 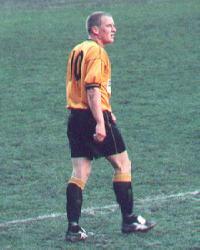 In November 1998, Steve suffered a broken leg playing against Halesowen, causing him to miss the rest of the season. However, he is now back to full fitness and completed his first full ninety minutes since breaking his leg in a pre-season match. Previous clubs: Leicester City, Leeds United, Bristol City, Birmingham City, Coventry City, Northampton Town and Peterborough United. Car: A Rolls Royce for himself and a Lada for his wife. An experienced defender, signed up after being released by Peterborough United at the end of last season. Has made over 400 League appearances, scoring 24 goals. David is a great fan of Roy of the Rovers. He thinks that the most memorable match ever played was between Melchester Rovers and Everpool Town, where Roy Race played a blinder. David suspects that Steve Evans and Trevor Quow always read Roy of the Rovers before deciding the team's tactics. The biggest influence on his career was Dave Richardson, the youth team manager at Leicester City when he played for them. The players that he most admired are Kenny Dalglish and German international Franz Beckenbauer. David thinks that his greatest achievement is that he can still hear after the manager's team talks. His claim to fame is that he once saw Steve Evans buy a drink, but he thinks that Steve found the money though. His biggest disappointment was letting Steve Evans into his house, as he is still paying for all the drinks. The sporting event outside of football that he would most like to see is Steve Evans running a marathon. He is not superstitious, touch wood. Signed from Mansfield Town in March 2000. Previous clubs include Preston North End, Blackpool, Chesterfield and Peterborough United. Born in Bolton. A product of the reserve side who has always done well in the first team colours. Outstanding control and ball skills and possesses an explosive long range shot. The player that Mark most admires is Roy Keane. 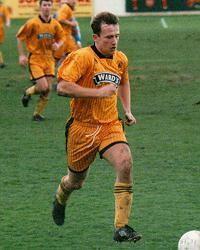 The most memorable match that he has played in was the Unibond League Cup final against Gainsborough Trinity in 1997. His advice to youngsters who want to make a career in football is to come along to CMS Sports & Leisure for coaching sessions. Away from football he likes playing tennis and badminton. 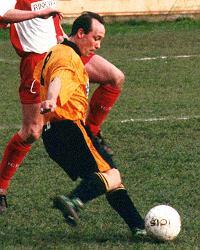 Ross Nicholls showed lots of potential in his first season with the club whilst in the "Football for Life" team. He made the breakthrough into the first team squad last season, providing useful cover on quite a few occasions. Hailing from the Ipswich area Ross has now settled in Boston and would like to become a regular first team player. One of the first products of United's successful reserve side. Neil played a few games for the first team in 96/7 and showed his versatility by acquitting himself very well in a variety of positions when called upon to do so. He moved on to play for Boston Town for a couple of seasons before moving back to the Pilgrims at the start of this season. He is also a three handicap golfer and is the current holder of the club championship at Boston Golf Club. 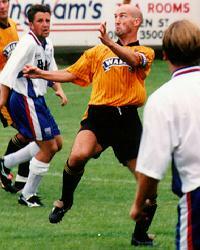 Steve Charles started at Boston United by scoring three goals in as many games, continuing his rich vein of goalscoring which made him leading scorer for Stalybridge Celtic in 96/7. It also vindicated Greg Fee's signing of this vastly experienced midfielder, with whom he and Chris Withe were team-mates at Mansfield Town. He was United's top scorer in 97/8. At the end of last season he left the Pilgrims to sign up with local rivals Gainsborough Trinity. 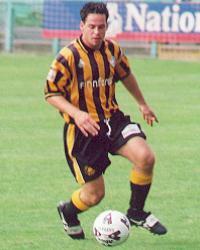 He returned to the club in October 99, following a change of management at the Blues. 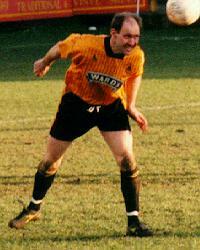 Ian Stringfellow joined Mansfield Town as an apprentice and soon graduated to the first team. 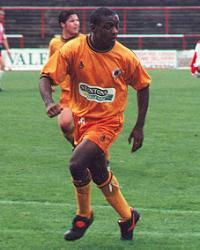 After making over 160 League appearances for the Stags he was transferred to Kettering Town for £5,000 in 1994. He only stayed with the Poppies for a year before going to Dagenham and Redbridge, then King's Lynn, where he was top scorer in 96/7. 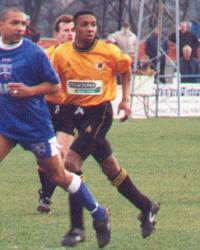 He left the Pilgrims at the start of the 99/2000 season to sign up with Cambridge City, but returned in March 2000. Previous clubs: Cambridge United, Kettering Town and Diss Town. Signed from Jewson Eastern Counties League Premier Division side Diss Town in February 2000 for £4,000. 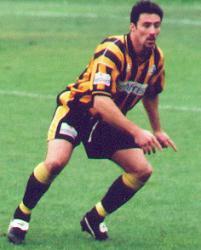 Previously with Cambridge United, where he made 34 Football League appearances, and Kettering Town. His most memorable match to-date was for Cambridge United against Carlisle, which was shown live on Sky Sport. The players he most admires are Ryan Giggs and David Ginola. In his spare time he likes playing golf and watching boxing. Previous clubs: Nottingham Forest, Bristol Rovers, Huddersfield Town, Swansea, Wrexham, Cambridge United, Preston North End, Leyton Orient, Kettering Town and Ilkeston Town. Signed from Ilkeston Town in February 2000. He has made 478 League appearances, for a variety of clubs, scoring 54 goals. He also has an F.A. coaching badge. In his leisure time he plays tennis and golf. His favourite ground is Nottingham Forest's City Ground. The player he admires most is Glenn Hoddle. Previous clubs: Peterborough United and King's Lynn. Local lad signed two seasons ago from King's Lynn. Joined Peterborough United straight from school, making two first team appearances. 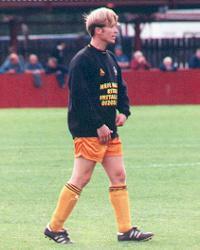 Moved on to King's Lynn FC before joining The Pilgrims in December 1996. He became a regular member of the first team with some impressive performances and some important goals. Last season he was selected to represent the Football Association in a match against the British Universities. In his spare time he enjoys watching boxing and playing badminton. His favourite ground is Old Trafford, his least favourite is the Barton Stadium, Winsford. The player he most admires is David Ginola. Previous clubs: West Bromwich Albion, Walsall, Birmingham City, Grimsby Town and Wisbech Town. Signed in the middle of last season following his dismissal as player manager at Wisbech Town. Childs had taken the "Fenmen" to the Second Round Proper of the FA Cup in the previous season, but the club's good form was not maintained resulting in his departure. 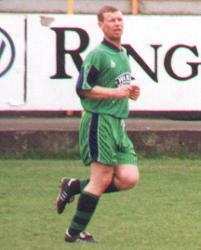 Prior to joining Wisbech he had played for a number of League clubs. In total he has made over 400 League appearances and scored 45 goals. He was also an England Youth International. The most memorable match he has played in was the League Cup semi-final against Liverpool, in 1984 when he was with Walsall. The players he most admires are Glen Hoddle and Bryan Robson. He says his biggest disappointment is having to play with Shaun Keeble! His claim to fame is that he has chased Ruud Gullit around Stamford Bridge (but never caught him). In his leisure time he likes to play golf. Previous clubs: Wyberton Colts, the Nottingham Forest Centre of Excellence, Grimsby Town Academy and Lincoln City Academy. 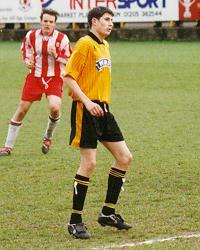 Youngster who joined the Boston United Academy at the end of the 1998/9 season. 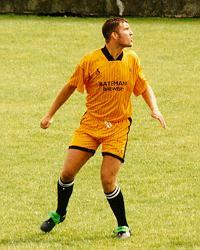 His impressive goal scoring with Boston United Reserves soon resulted in a call up to the first team squad. He has also scored nine goals in five games when playing for the Lincolnshire FA Under 18 side. Anthony says that it is all down to Chris Cook that he is at Boston United. He is also pleased that Steve Evans is taking an interest in the young players at the club, giving them an opportunity to succeed. He is being sponsored by United director Roy Hackford, for which Anthony is very thankful. His most memorable match to date was when he played for the Nottingham Forest youth team in a match against Liverpool, which Forest won 2-1 with Anthony scoring one of the goals. The player he admires most is David Ginola. Outside of football, the sporting event he would most like to see is a Formula One Grand Prix. Occupations: Student & Supermarket assistant at Iceland. 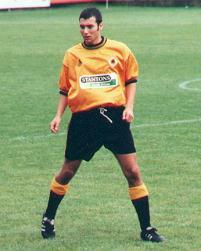 Towards the end of the 1996-97 season, Boston United were chosen as one of a select band of clubs in the country to pioneer the unique "Football for Life" scheme. The scheme was run under the guidance of Bedford College and gave young footballers the chance to play football with a semi-professional club and also study for a Diploma in Sports Science. Boston United attracted youngsters from as far away as London, Ipswich, Barnsley and Melton Mowbray, as well as quite a number of local lads. Most have already made an appearance for the reserve team and one player who has made his first team debut is teenager Leigh Taylor. Previous clubs: Rushden & Diamonds. Young striker signed last season from Nationwide Conference side Rushden & Diamonds. He scored on his debut for the Pilgrims. Mark is a fan of Italian football, his favourite players being Roberto Baggio, Alessandro Del Piero, Zinedine Zidane and George Weah. His biggest disappointment so far was missing out on the FA Cup game against Leeds United through injury whilst at Rushden & Diamonds. He enjoys playing basketball in his leisure time and would like to go to the US to watch the basketball playoffs some time. Previous clubs: Peterborough United, Crewe Alexandra, Carlisle United, Cheltenham Town, Wycombe Wanderers, Kettering Town, Dagenham & Redbridge, Rushden & Diamonds, Burton Albion and King's Lynn. Born in Boston and a former pupil at Boston Grammar School where he obtained six O-levels. Signed up for the Pilgrims for the third time during the close season. He first played for Boston in 91/2 when he became the Pilgrims record signing following a £14,000 move from Wycombe Wanderers. 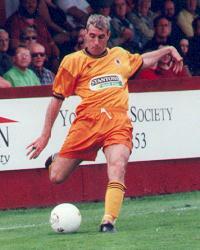 He later joined Rushden and Diamonds for £10,000 where he was top scorer in 1993/4 with 39 goals. His most memorable match was when he scored a hat-trick for Wycombe Wanderers in a 4-2 win against Altrincham in the Conference in August 91. The players that Mick most admires are Kenny Dalglish and Paul Gascoigne. 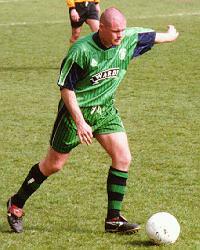 The greatest influence on his career was Martin O'Neill when he was Mick's manager at Wycombe Wanderers. He likes playing squash in his spare time. The only superstition that he has is that he makes sure he puts his shirt on last before going out to play. Previous clubs: Bradford City (where he played with Greg Abbott! ), Rochdale, Peterborough United, Lincoln City and Kettering Town. Signed after returning from a spell in Hong Kong. Has made over 100 League appearances, scoring 19 goals. His most memorable match was when he played for Bradford City against Leeds United at Elland Road in March 1989. The match, in the old Second Division, was played in front of a crowd of 33,325. It ended in a 3-3 draw and Peter scored the second Bradford goal with a stunning 25 yard volley. The biggest influence on his career has been Geoff Lee, the Bradford City youth team coach. 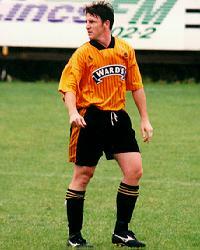 The footballers he has most admired are Stuart McCall (Bradford City) and Mick Halsall (Peterborough United). His only current superstition is that he goes out behind Mick Nuttell, both at the start of the game and at half-time and pats him on the back and wishes him well. In his spare time he likes playing golf, watching horse racing and most of all, spending time with his daughter Hope. When he has finished playing he hopes to stay in the game, either as a coach or a manager, he is currently taking his UEFA B. Badge. Previous clubs: Holbeach United, Wisbech Town, Corby, Eynesbury Rovers, Raunds Town and King's Lynn. 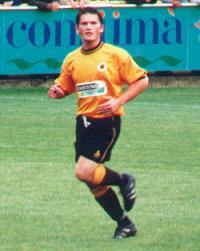 A prolific striker signed up in February 2000 after being released by King's Lynn. Previous clubs include Holbeach United, where he was a member of their 1990 United Counties League title winning side and Raunds Town where he scored 31 goals to help them win the United Counties League title in 95/6 and promotion to the Dr. Martens League. He is also the career goalscoring record holder for Raunds Town with 208 goals. His biggest disappointment was losing to Arlesey Town in the FA Vase semi-final in 94/5 when playing for Raunds Town. The players he most admires are Alan Shearer and Gary Lineker. He enjoys playing cricket, golf and fishing in his spare time and would like to go and watch the Cricket World Cup Final one day. Last season Paul scored 15 goals for the first team to make him second highest scorer. This goalscoring prowess attracted the attention of a number of League clubs, including Bolton Wanderers, Bristol City, Northampton Town and Carlisle United. Steve Evans has attached a �70,000 price tag to Paul, but will only sell him if the deal is right for both him and the club. Status: One child with partner Jo. Previous clubs: Norwich City, Bradford City, Peterborough United, Hibernian, Plymouth Argyle and Halifax Town. Cars: A Jaguar and a Mercedes. A much travelled striker, who never quite achieved his full potential after a promising start to his career with Norwich City. As a teenager, he broke into the Norwich first team and also made a number of appearances for the Republic of Ireland Under-21 side where he was their young "player of the year" in 1994. He played in the Norwich side which reached the third round of the UEFA Cup in 93/4, where they were narrowly beaten by an Inter Milan side containing the likes of Bergkamp, Schillaci, Zenga and Bergomi. After scoring 10 goals in 44 League appearances for the Canaries he became Bradford City's record signing for £200,000 in March 1994. Despite scoring in his first two matches for the Bantams he could not maintain his form and he left the Valley Parade Ground after one season to join up with Peterborough United for £80,000. A move north of the border to play for Hibernian for a transfer fee of £100,000 soon followed, but he fell out of favour following a change of management and a free transfer to Plymouth Argyle beckoned. 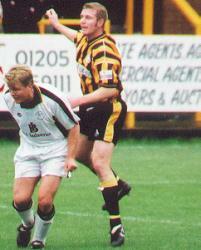 A further free transfer to Halifax Town followed, before he was snapped up for £15,000 by the Pilgrims in November 99 to become their record signing. 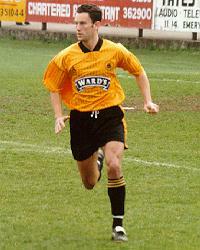 In total he has made 180 League appearances and scored 32 goals in the English and Scottish Leagues. He scored on his debut for the Pilgrims. Lee claims that one of the advantages of being a footballer is that you become super fit and gain a six pack, but the downside of this is the diet of pasta and water. The sporting event that he would most like to see is Steve Evans and David Rennie mud wrestling. One of his most memorable achievements was scoring from 30 yards out past Manchester United's Peter Schmeichel in his first season at Norwich. Signed up pre-season from Nuneaton Borough, he scored 19 goals last season in the Dr. Martens League. Previously with Barnsley, Sheffield Wednesday, Dundee, Rotherham United, Halifax Town, Scunthorpe United, Bradford City and Cambridge City. Born in Huddersfield, he is the brother of former Arsenal forward Chris Kiwomya. Signed up from Dr. Martens League Midland Division side Stamford AFC at the start of the season after impressing in pre-season trials. He previously played in the Peterborough Sunday League. Signed in September 99 from Ilkeston Town, where he had scored the winning goal against the Pilgrims in their match earlier in the season. He started his football career with Leeds United, at the same time that David Rennie was with the club, but he moved on to Doncaster Rovers after making only one first team appearance. He made over 100 League appearances for Doncaster before moving on to Mansfield Town for £25,000 and then to Chester City. Overall he has made 274 League appearances and scored 54 goals. Last season he played for Maltese side Hibernians. Born in Preston. A young striker signed up from Dr. Martens League Southern Division side Raunds Town where he had been top scorer with 33 goals in 98/9. Previously with Cogenhoe in the United Counties League. Another product of The Pilgrims' reserve side. 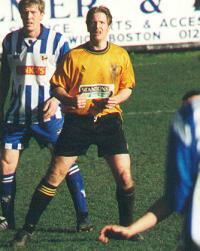 Made a few Unibond appearances as substitute towards the end of the 1996/7 season. He now works on CMS Sports as a football coach as well as appearing in a rock band. Born in Barnsley. 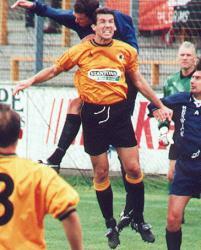 Returned to York Street last season after spending a two month loan period with "The Pilgrims" in the 1996-97 season. 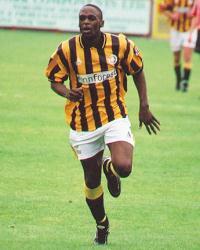 Previously with Barnsley, he also had spells with Gateshead and Emley. Signed up from Crawley Town at the end of last season after his contract expired. Based in Cambridge, Andy had joined Crawley at the start of last season after playing with Cambridge City for three seasons. Prior to that he had played for Bury Town and Sudbury Town, both sides being in the Eastern Counties League. 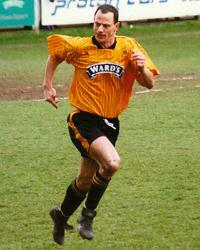 Previously with Mansfield, where he played six League games in 98/9. He was signed after extensive trials with the reserves. Born in Peterborough. Signed up after being released by Scarborough following their relegation to the Conference. Gary started his football career as an apprentice at Watford. He graduated to the first team in 1984 after representing England at Youth and Under 21 levels. 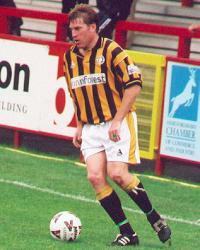 He made 472 appearances and scored 55 goals in 13 seasons for the Hornets. He signed up with Walsall in 1997 making 63 appearances and scoring 3 goals before being loaned out to Scarborough for the last four months of last season. He was born in Sunderland. However United's investment in Martin was money well spent as it has resulted in many years sterling service to the club. He has been present ever since, except for one season when released by manager Peter Morris but quickly returned to the club, to the supporters' delight, following Morris's departure. 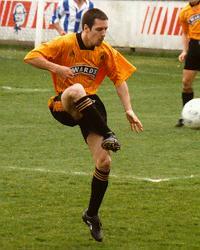 He also had a brief spell at Worksop Town at the start of the current season. Martin was awarded a deserved testimonial last season. 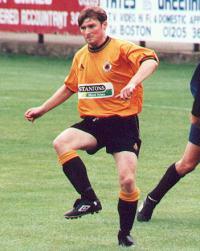 Signed pre-season for £5,000 from Worcester City, where he had been Player of the Year in 97/8. 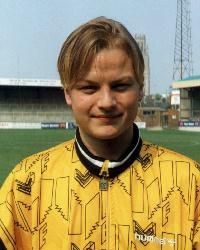 He started his footballing career as a trainee at Notts County before moving to Northampton in 1991. 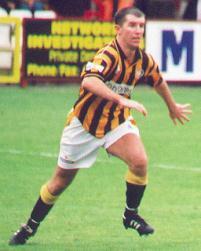 He played for the "Cobblers" for three seasons, making 88 League appearances and scoring 2 goals. 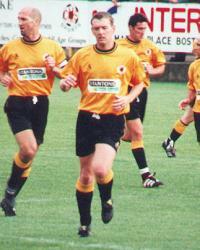 He was transferred to Chester City in 1994 and then to Worcester City in August 1996. Born in Mansfield. 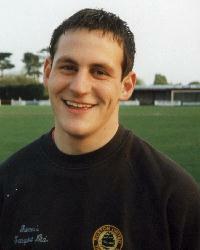 Signed up from Kingstonian as midfield cover in October 99 following injuries to key players. Born in Glasgow, he started his footballing career by signing up with Rangers, but left to join Clydebank without making any first team appearances. 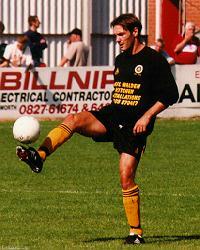 He made 27 appearances for Clydebank before moving across the border to play for both Grimsby and Mansfield. 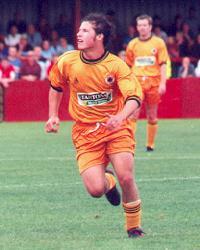 He made 74 appearances, scoring 4 goals before moving on to Kingstonian at the start of the 99/2000 season. 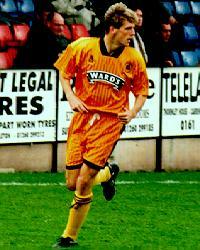 Much travelled midfielder, signed up in September 99 from Gainsborough Trinity. He started his footballing career in Scotland, playing for both Celtic and Motherwell. He then moved south of the border to play for Doncaster Rovers, Barnsley, Rotherham United, Scarborough and Grimsby Town. Overall he has made over 400 League appearances and scored 46 goals. Born in Dunfermline. Photographs copyright © Ken Fox and Roy Hackford, 1999.